On Saturday, David Barton successfully completed his personal challenge to finish 50K on his 50th birthday. Despite the wind, the rain, and getting a late start due to having to zip tie the pop-up canopy back together, he persevered for over seven long hours to complete 125 laps of the high school track. 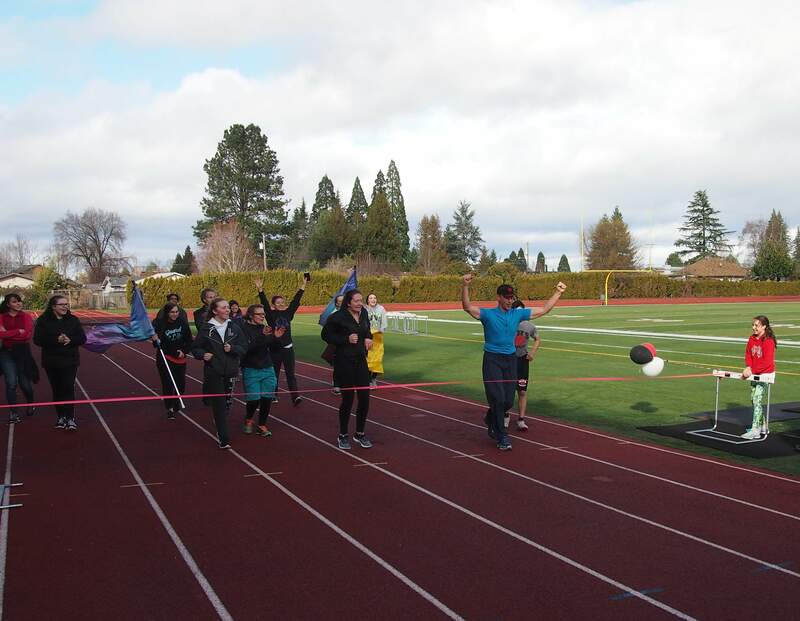 Throughout the day he was accompanied and cheered on by family, band parents, and a whole bunch of students who came to walk or run a few laps with him. He put a great deal of effort into this 50K and we who were there are more than impressed with his determination. As you know this was also a fundraiser for the band, and while it hasn’t yet reached the goal, we are hopeful the progress bar will keep moving. You can also visit the Gallery page to see photos of the event. On Saturday, March 3rd, the Oregon Crusaders will present Show of Hands, an indoor Percussion and Winds show and competition at McMinnville High School. The MAC BAND will be running the concessions booth as a fundraiser. Sign-up sheets will soon be posted in the bandroom for student help. We will also need adult volunteers as well. Please send a note to mbpo@gmail.com if you can assist. THANK YOU! Leave McMinnville at 8:00 am. Return about 9:00 pm.